I had never been aware of the fabulous gardens. I have fond memories of both the Kinetic Playground and the ice arena. Great old postcards but the google map photo is out of date. That whole set of buildings have been torn down. Its a shame really. Yeah, it's a bit out of date in terms of the surrounding buildings, but the photo does show the Rainbo Village condos that now stand in place of the gardens. Thanks for the links, adgorn. 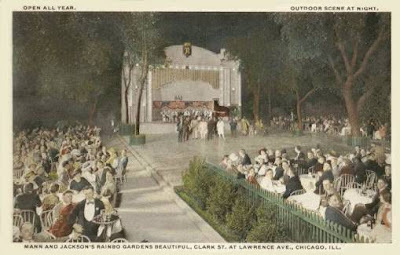 :-) Jazz Age Chicago is one of the best resources for entertainment history. Rainbo Gardens, Clark and Lawrence, Uptown, Chicago. 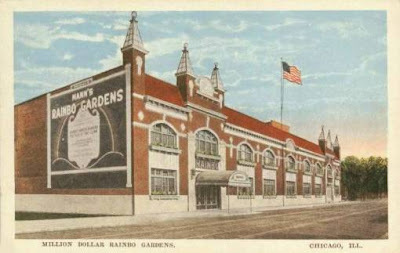 Before it became an ice skating rink, a roller arena, or a hip rock club, Rainbo Gardens was the premiere northside entertainment destination with a casino, vaudeville/music stage, two-story beer hall, outdoor dance floor, and even a bowling alley! Three Stooges fans should note that this is where Larry Fine was working as a Master of Ceremonies when he was discovered by the Stooges and invited to join the troupe. I found a huge amount of info along with photos of both the Rainbo and the Aragon in the book "That Toddlin Town" by Charles Sengstock Jr.